Younger students: You will need 1 single serving (mini) bag of popcorn. Have students predict how many kernels will pop. Do they think they all will pop? If not, how many will stay a hard kernel? Microwave the bag. As a class, count the corn. 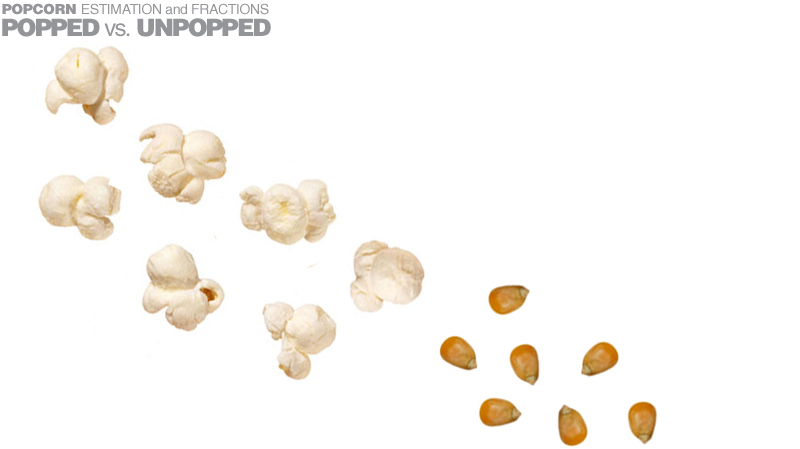 Write a fraction for popped and unpopped. Whose guess was the closest? Optional: Compare with a different brand of popcorn. Older students: Which brand pops the most kernels?! Split students up into four groups. You will need 4 single serving (mini) bags of popcorn (2 different brands). First, have students estimate how many pieces of popcorn will pop in their group's bag. How many kernels won't pop in their bag? Microwave each bag for the same amount of time and give each group their bag. Have them count the popcorn (split popcorn into groups, so each person is in charge of counting; then, they combine their number to figure out the total). Next, have them write the fraction for popped and unpopped. Which group's guess was the closest? Which brand reigns supreme? Did the groups with the same brand have similar results? Did one of the brands have completely different results? Which brand is most reliable?